(University Press of New England: cloth, 122 pages, $26.00). lot except read good books, interview nice people, and write about it. 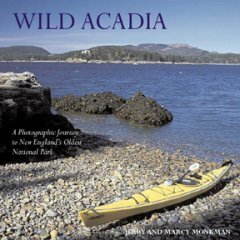 Mountain Wilderness, published by University Press of New England in 2005.
and essays will lead you to spots off the beaten track you might have missed. crowds do not enhance the wilderness experience. the cracks in the rocks." humpback whales, which feed on the shoals near Mount Desert Rock . . . "
Vanderbilts, Morgans), and now playground for all. paint this place with admiration, affinity, and affection. time with friends and loved ones. wilderness, and inspiration that both refresh and define my life. named their daughter after it: Acadia Nationalpark Monkman. Just kidding about the middle name. Click here to see Jerry Monkman's gallery on this site.